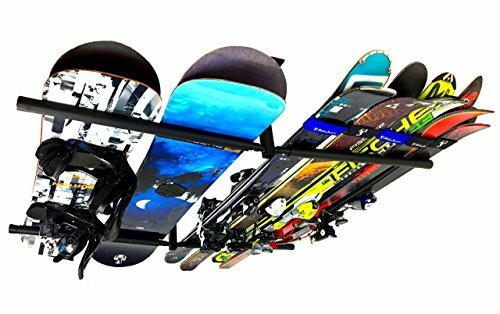 StoreYourBoard, the leaders in sports storage, bring you its new, patent-pending, heavy-duty multi ski and snowboard ceiling storage rack! Durable, Steel Construction. This Ski and Snowboard Ceiling Rack is an incredibly sturdy way to store your snow gear in your overhead space, organizing and saving you room. This rack is made from heavy duty steel and supports up to 150 pounds (75 lbs per side)! It's more than sturdy enough to mount multiple skis of different types (powder, XC, etc.) and multiple snowboards to your ceiling at home, in your garage, or in your shop. Ski and Snowboard Protection. The Ceiling Rack's arms come covered in high-density, foam padding. This isn't the cheap pipe insulation kind, it's thick, top-quality foam to protect your gear for years to come. Want to remove the rack's arms? No problem, they remove with a simple push-button. Easy Installation One huge innovation in this rack is that it can be installed along ceiling joists that run in either direction - the center column rotates to fit your setup. This rack is also super easy to install, coming with the necessary mounting hardware - heavy duty lag bolts - so you can set it up quickly and easily! Fit: What Skis and Snowboards Will it Hold? -Weight: holds a combination of gear up to 150 lbs total (75 lbs per side). -Width: 25" wide arms can hold multiple sets of skis and snowboards, stack them how you want! -Length: the 2 rack sides are independent so can be mounted at whatever distance apart you need, to fit the length of your gear. Need a vertical or horizontal wall storage rack? Search "StoreYourBoard Ski" in Amazon.